There is no hibernating for us this winter. Lisa is jumping around from Durham/Washington D.C./New York, while Katie completes her MFA in Brown University’s Writing for Performance program in Providence. We will be excited to reconnect with you later in 2015 for new developments with Milton and How to Build a Forest… lots bubbling for both projects. Currently, we are working hard on getting Milton to Oregon– busily writing both national and regional grants with our partners in Milton-Freewater. Katie was recently in Seattle planning for a Milton-inspired residency PearlDamour will be doing with the University of Washington Drama School throughout 2015/16, which will also help us get to Milton-Freewater for several site visits next year. In Milton, NC, the ripples of the project are still being felt– we were overwhelmed by the excitement our show last August has generated, and are thrilled with the action now be taken by the town to build on the momentum begun by the project. The Thomas Day House Board is busy applying to at least 5 different organizations for funds to support an annual Thomas Day Performance Festival, and local gallery owner/ceramicist has located an artist to create a mural on the side of a building to both welcome visitors and alert drivers to the fact they are driving through the historic town of Milton. The Danville Regional Foundation, one of our project’s supporters, is featuring Milton, NC as one of five towns or “Bright Spots” that they fund, with a special focus on our show “Milton.” We are so proud and excited to continue our relationship with Milton, NC as they take on these new events and projects. Last but certainly not least, we want to give a shout out to our dear friend Twinkle Graves in Milton, NC! 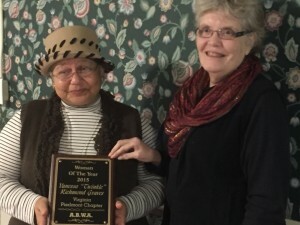 She was nominated for the ABWA Woman of the Year Award in December– here you can see a picture of the ceremony. Twinkle has been a huge advocate for our project and a wonderful host whenever we are in Milton. She dives into every new challenge with us with gusto, a great attitude, a huge smile, and lots of hugs. Plus we adore her chicken salad shells. She is a beloved and respected member of that community– we’re so happy she was recognized in this way.